The plan came together flawlessly. For some reason, photographer Richard Roth wanted to go canoeing in the Beaver River. In December. On a -18 C day. And somehow he managed to wrangle together a few other suckers to make it happen. Northwinds Skis athlete Greg Sturch and the adventurous Nads (I don’t know her real name…) were down, plus myself. Although Nads did look a little sceptical at times. Which was totally justifiable. I was too. We scoped the pull-out at Slabtown before going upstream and fully committing. And once we’d chipped away a bit of ice, we were confident we had a place to get out of the boats when we arrived. Yeah, it was a fairly steep riverbank, but if we took our time and were careful, we’d be fine. The other choice was going over the Slabtown Dam. Which wasn’t much of an option. Nor was dumping the boat here. The temperatures, the current, the ice over the river downstream, were all not to be messed with. I wouldn’t have walked on the ice downstream, but it didn’t mean I was ready to swim under it. We put in upstream at Heathcote. It’s a classic Free Spirit Tours river trip; takes an hour, is great for kids and a total blast. But in this weather, it felt, not gonna lie, a bit dangerous. Stepping one foot into the stern of the canoe while the other pushed off the riverbank felt like a foolish commitment. After that, it just felt like canoeing. On a gently flowing river. Easy. At the last moment, a narrow, fast-flowing, parabolic channel revealed itself. So we shot it. As we drifted downstream, we high-fived and celebrated our success. Richard and I were in the same boat shooting photos. Thousands of photos. Thousands of photos which are all pretty much exactly the same. We floated through sections of water with a top layer of slush. And we laughed at how awesome we were. Then we saw the river ice over ahead. I quietly panicked wondering what happens when the current pushes you onto ice. Do you tip? Do you get stuck on top? Does the ice break all around you until you’re stuck? Does the current push you under? I realized I didn’t care to know the answer when, at the last moment, a narrow, fast-flowing, parabolic channel revealed itself. So we shot it. It was pretty easy, but it was a moment where I questioned the whole misguided shenanigan. After a few meandering kilometres and some uneventful but lovely ‘winter canoeing,’ we loaded our camera gear into the other boat, just in case disaster struck. Then we headed in to our final port of call. And I had a plan. My plan was to eddy into the break in the ice, nose up to the riverbank and hold us there while Richard carefully stood on the bank and got out of the boat. But before I had a chance to eddy into the riverbank, Richard had one foot out of the boat and was jumping for it. Instinctively I white-knuckled the gunnels and held on, prepared to go swimming. I swear on all that is holy, that boat came to within a millimetre of flooding on the upstream gunnel. It was terrifying. Now I have no idea how much canoeing experience Roth has. Maybe tons. I can say that his exit that day wasn’t good. He’ll claim he did everything in his power not to dump me as well, and for the most part, I’ll think he did. And I really, really appreciate that. Instinctively I white-knuckled the gunnels and held on, prepared to go swimming. I swear on all that is holy, that boat came to within a millimetre of flooding on the upstream gunnel. It was terrifying. Technically, Richard’s head did submerge completely. But the amount of time it took for his head to be fully underwater until he was on the riverbank six feet from the river’s edge was miniscule. A fraction of an instant. If you blinked slowly you would have missed it. It was incredible. And it was, without a doubt, hilarious. But watching the way Richard responded was awesome. He took it like a man. He laughed. He wringed out his toque put it back on and started getting us on shore. He pulled the boats out of the water hiked quickly to his car, got in, cranked the heat and demanded some hot tea from his thermos. We obliged happily. He was probably at Rusty’s later that night with one more hilarious story to share. For a guy with an encyclopedia of funny stories to share. Of course now we’re in competition trying to sell these photos (to all the same clients), and you know what? 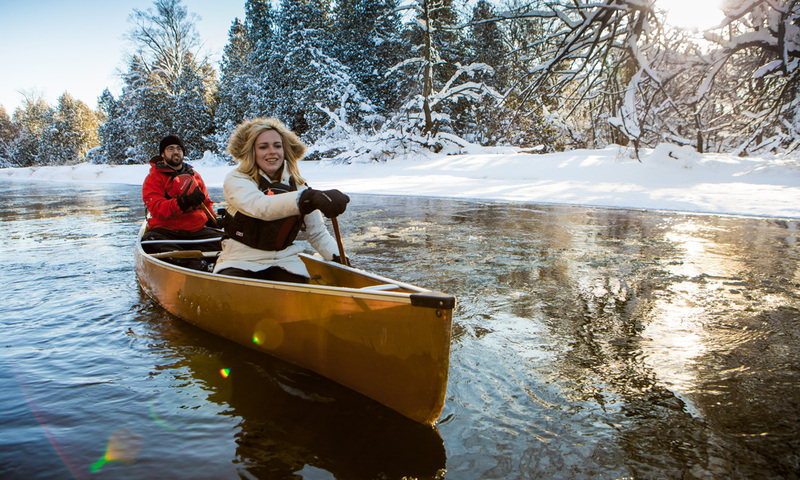 Turns out, no one really needs ‘winter canoeing’ photos. It just isn’t a thing. 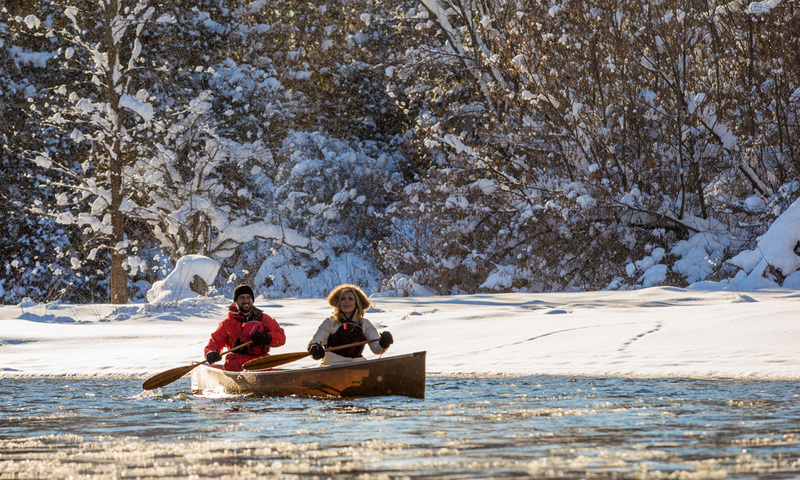 No one has ever needed winter canoeing photos and no one ever will. The trip wasn’t a bust. It was a great day on the river that reminded me how much I love being out in zee wilderness. Next time you have some shenanigans planned, Richard, give me shout. I’m in. I’ll just be sure to get in the other boat next time.